Keep your boat looking great with Marine 31! The Marine 31 Detailer's Boat Care Kit takes the guess work, and the work, out of maintaining your boat's finishes. Each product has been carefully selected to provide maximum results with in a minimal amount of time. Marine 31's product range is easy-to-use and environmentally friendly! Marine 31 Gel Coat Wash & Wax with Carnauba is formulated to be the perfect shampoo for your nautical needs. This biodegradable shampoo combines slippery surfactants with natural carnauba wax to create a shampoo that floats away dirt and grime away while leaving behind a high-gloss protective coating. Marine 31 Gel Coat Wash & Wax with Carnauba is fully biodegradable to protect the delicate marine and plant life. Marine 31 All-In-One Gel Coat Polish & Wax makes it easy to keep your boat looking ship-shape! Marine 31 All-In-One Gel Coat Polish & Wax utilizes an advanced combination of micro-abrasives, cleaning agents, nourishing oils, and premium wax protection to take back what the sea environment takes away. This one-step solution removes light oxidation, cloudiness, and stains from gel coat while imparting a high-gloss protective wax finish. The Super Plush Micro-Chenille Wash Mitt holds a huge volume of water and soap solution in its long microfiber fingers. These microfiber fingers lathers your delicate gel coat surface in suds while gently removing the sharpest grit, reducing swirl marks and washing damage. The microfiber fingers of the Super Plush Micro-Chenille Wash Mitt are 40% larger than standard micro-chenille wash mitts. Best of all, this mitt is fortified with a double-stitched cuff with a soft double-insulated liner. The result is a comfortable, durable wash mitt that is suitable for washing all of your boat's surfaces. A Tip From The Captain’s Chair: It is no secret that boat owners would rather be on the open seas then washing grime from their vessel. 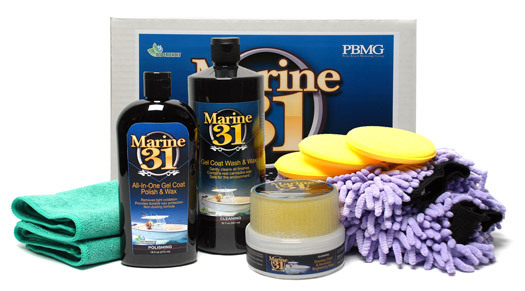 The Marine 31 Detailer's Boat Care Kit is designed to make boat cleaning and polishing fast and easy so you can spend more time on your voyage! A total retail value of $91.90. You save $11.91!